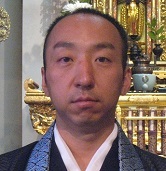 Reverend Katsuya Kusunoki is the Head Minister of the Seattle Betsuin Buddhist Temple. Sensei was born in Nagasaki, Japan, the second son of a temple family. Today his older brother Naoya is the 17th generation of their family to serve their family temple. Sensei is a graduate of Miyazaki University where he majored in primary education and his hobby is to watch and play baseball and softball. While a college student he took a break and spent almost two and a half years in a Japanese volunteer program similar to the Peace Corps in America coaching baseball in Zimbabwe before returning to Japan to complete his studies. After graduating he spent three years teaching 3rd and 6th grade classes before deciding to become a minister. 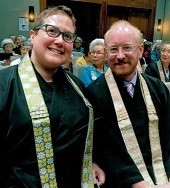 Minister’s Assistants Matt & Rosalie May were certified as Minister’s Assistants in the fall of 2013 and went on to receive their Tokudo* ordination together in the summer of 2016 at our mother temple, the Nishi Hongwanji in Kyoto, Japan. Matt works for Adobe and manages their Accessibility organization. Minister’s Assistant Leonora Clarke became a certified minister’s assistant in the fall of 2013. 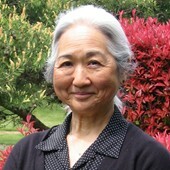 She has a degree in Comparative Religions and has completed the two year Jodo Shinshu Correspondence Course offered by the BCA’s Jodo Shinshu Center. 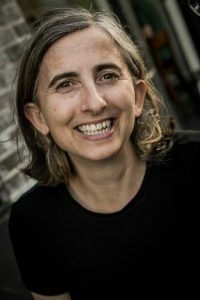 Leonora works for the University of Washington School of Medicine. Minister’s Assistant Joe Schwab is one of the four members of the Seattle Betsuin’s first class of Minister’s Assistants who received certification in the summer of 2005 (the others were Bill Hirsch, Kevin Tanemura and Jim Warrick). Joe, along with the temple’s other Minister’s Assistants, volunteers at the temple helping to deliver the temple’s religious services. They also assist Rinban in supporting our sister temples in eastern Washington. 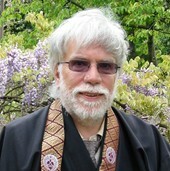 *Tokudo ordination – the first formal step of training to become a minister in the Jodo Shinshu tradition.